A touchscreen, or touch screen, is an input device and normally layered on the top of an electronic visual display of an information processing system. A user can give input or control the information processing system through simple or multi-touch gestures by touching the screen with a special stylus or one or more fingers. Some touchscreens use ordinary or specially coated gloves to work while others may only work using a special stylus or pen. The user can use the touchscreen to react to what is displayed and, if the software allows, to control how it is displayed; for example, zooming to increase the text size. Touchscreens are common in devices such as Nintendo game consoles, personal computers, electronic voting machines, and point-of-sale (POS) systems. They can also be attached to computers or, as terminals, to networks. They play a prominent role in the design of digital appliances such as personal digital assistants (PDAs) and some e-readers. The prototype x-y mutual capacitance touchscreen (left) developed at CERN in 1977 by Frank Beck, a British electronics engineer, for the control room of CERN’s accelerator SPS (Super Proton Synchrotron). This was a further development of the self-capacitance screen (right), also developed by Stumpe at CERN in 1972. The first mobile phone with a capacitive touchscreen was LG Prada released in May 2007 (which was before the first iPhone). Touchscreens would not be popularly used for video games until the release of the Nintendo DS in 2004. Until recently[when? ], most consumer touchscreens could only sense one point of contact at a time, and few have had the capability to sense how hard one is touching. This has changed with the commercialization of multi-touch technology, and the Apple Watch being released with a force-sensitive display in April 2015. 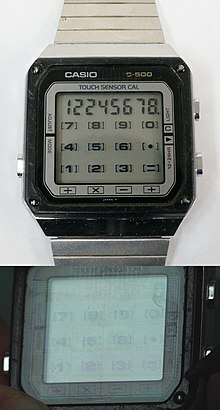 The Casio TC500 Capacitive touch sensor watch from 1983, with angled light exposing the touch sensor pads and traces etched onto the top watch glass surface. 8 x 8 projected capacitance touchscreen manufactured using 25 micron insulation coated copper wire embedded in a clear polyester film. 2) the change in value for each key being compared with the relative change in value for each of the other keys, to see if the pattern of change corresponded to the change that would be expected to be caused by a nearby finger, as opposed to localised heating, rain, or other environmental factors. 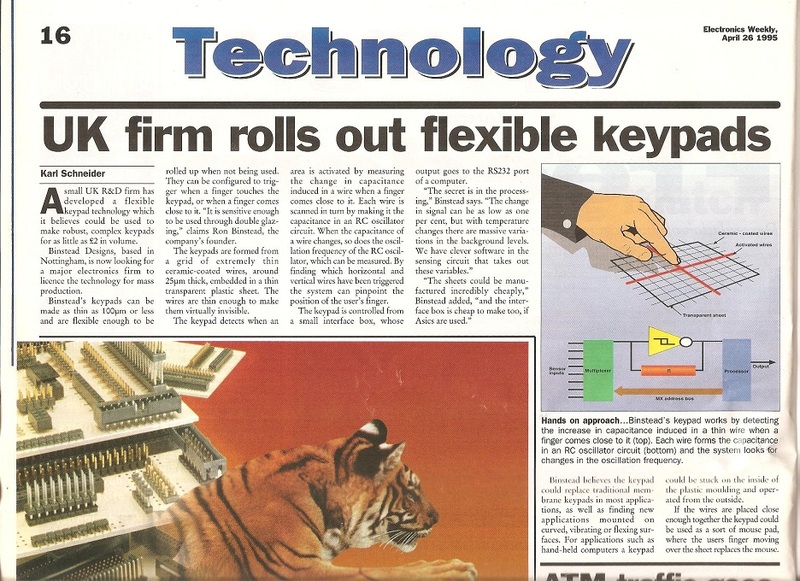 In 1989 the 16 discrete copper foil keys of the keypad were replaced with 16 transparent Indium Tin Oxide keys, creating a clear keypad / touch screen that could sense through thick glass. A simple to manufacture, multiple input, x/y multiplexed version of this touch screen was invented in 1994. This could use Indium Tin Oxide, or 10 to 25 micron diameter insulation coated copper wires as the sensing elements. The first version enabled 64 touch positions to be detected with just 16 inputs. (See image on the right). Due to their low cost and ability to survive in hostile environments, 7000 of these were used by JPM International in their 'Monopoly' and 'Cluedo' pub gaming machines. In 1997 much higher touch resolution was enabled by the introduction of more (16 + 16) inputs and interpolating between the 256 touch positions where these sensing elements intersected . In 1999, the ability of this technology to sense through thick non-conductive materials was publicly termed ‘Projective Capacitive’ for the first time. Some modern PCT touch screens are composed of thousands of discrete keys, but most PCT touch screens are made of a matrix of rows and columns of conductive material, layered on sheets of glass. This can be done either by etching a single conductive layer to form a grid pattern of electrodes, or by etching two separate, perpendicular layers of conductive material with parallel lines or tracks to form a grid. In some designs, voltage applied to this grid creates a uniform electrostatic field, which can be measured. When a conductive object, such as a finger, comes into contact with a PCT panel, it distorts the local electrostatic field at that point. This is measurable as a change in capacitance. If a finger bridges the gap between two of the "tracks", the charge field is further interrupted and detected by the controller. The capacitance can be changed and measured at every individual point on the grid. This system is able to accurately track touches. Due to the top layer of a PCT being glass, it is sturdier than less-expensive resistive touch technology. Unlike traditional capacitive touch technology, it is possible for a PCT system to sense a passive stylus or gloved finger. However, moisture on the surface of the panel, high humidity, or collected dust can interfere with performance. These environmental factors, however, are not a problem with 'fine wire' based touchscreens due to the fact that wire based touchscreens have a much lower 'parasitic' capacitance, and there is greater distance between neighbouring conductors. Self-capacitance sensors can have the same X-Y grid as mutual capacitance sensors, but the columns and rows operate independently. With self-capacitance, the capacitive load of a finger is measured on each column or row electrode by a current meter, or the change in frequency of an RC oscillator. This RC method produces a stronger signal than mutual capacitance, but, until recently, it was unable to resolve the positions of more than one finger without ambiguity, due to "ghosting" or misplaced location sensing. However, in 2010 a new method of sensing was patented  which allows some parts of a capacitance sensor to be sensitive to touch while other parts are insensitive.The patent author discovered that a Self Capacitance sensing conductor (x), in an x/y array of conductors, cannot detect the close proximity of a finger if the (x) conductor is crossed by a conductor (y) whose waveform is 180 degrees out of phase with its own sensing waveform . This makes it possible to mask off ambiguous (possible ghost) intersections to confirm if a finger is close to that intersection or not . For the first time this enabled Self capacitance to be used for multi-touch without "ghosting" . Capacitive touchscreens do not necessarily need to be operated by a finger, but until recently the special styli required could be quite expensive to purchase. The cost of this technology has fallen greatly in recent years and capacitive styli are now widely available for a nominal charge, and often given away free with mobile accessories.These consist of an electrically conductive shaft with a soft conductive rubber tip, thereby resistively connecting the fingers to the tip of the stylus. Infrared sensors mounted around the display watch for a user's touchscreen input on this PLATO V terminal in 1981. The monochromatic plasma display's characteristic orange glow is illustrated. This diagram shows how eight inputs to a lattice touchscreen or keypad creates 28 unique intersections, as opposed to 16 intersections created using a standard x/y multiplexed touchscreen . 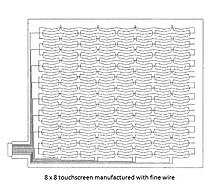 In 1995 Binstead Designs patented a very simple to manufacture, multiple input 'fine wire' based touchscreen . A real practical integration between the television-images and the functions of a normal modern PC could be an innovation of a probable very near future: for example "all-live-informations" on internet about a film or the actors on video, other list of music during a normal video clip of song, all news about all things or persons, ideas and concepts, etc. ^ Walker, Geoff (August 2012). "A review of technologies for sensing contact location on the surface of a display". Journal of the Society for Information Display. 20 (8): 413–440. doi:10.1002/jsid.100. Archived from the original on 2015-03-23. ^ Beck, Frank; Stumpe, Bent (May 24, 1973). Two devices for operator interaction in the central control of the new CERN accelerator (Report). CERN. CERN-73-06. Retrieved 2017-09-14. ^ Johnson, E.A. (1965). "Touch Display - A novel input/output device for computers". Electronics Letters. 1 (8): 219–220. doi:10.1049/el:19650200. ^ "1965 - The Touchscreen". Malvern Radar and Technology History Society. 2016. Archived from the original on 31 January 2018. Retrieved 24 July 2017. ^ Johnson, E.A. (1967). "Touch Displays: A Programmed Man-Machine Interface". Ergonomics. 10 (2): 271–277. doi:10.1080/00140136708930868. ^ Orr, N.W. ; Hopkins, V.D. (1968). "The Role of Touch Display in Air Traffic Control". The Controller. 7: 7–9. ^ "Another of CERN's many inventions! - CERN Document Server". CERN Document Server. Retrieved 29 July 2015. ^ USPTO. "DISCRIMINATING CONTACT SENSOR". Google. Archived from the original on 19 May 2013. Retrieved 6 April 2013. ^ F. Ebeling, R. Johnson, R. Goldhor, Infrared light beam x-y position encoder for display devices, ‹See Tfd›US 3775560 , granted November 27, 1973. ^ The H.P. Touch Computer (1983) Archived 2017-08-24 at the Wayback Machine. YouTube (2008-02-19). Retrieved on 2013-08-16. ^ "Terebi Oekaki / Sega Graphic Board - Articles - SMS Power!". Archived from the original on 23 July 2015. Retrieved 29 July 2015. ^ Biferno, M.A., Stanley, D.L. (1983). The Touch-Sensitive Control/Display Unit: A promising Computer Interface. Technical Paper 831532, Aerospace Congress & Exposition, Long Beach, CA: Society of Automotive Engineers. ^ "1986, Electronics Developed for Lotus Active Suspension Technology - Generations of GM". History.gmheritagecenter.com. Archived from the original on 2013-06-17. Retrieved 2013-01-07. ^ Badal, Jaclyne (2008-06-23). "When Design Goes Bad - WSJ.com". Online.wsj.com. Archived from the original on 2016-03-16. Retrieved 2013-01-07. ^ "The World Leader in GNU-Linux Restaurant POS Software". Viewtouch.com. Archived from the original on 2012-07-17. Retrieved 2013-01-07. ^ "File:Comdex 1986.png - Wikimedia Commons". Commons.wikimedia.org. Archived from the original on 2012-12-20. Retrieved 2013-01-07. ^ "1991 video of the HCIL touchscreen toggle switches (University of Maryland)". Archived from the original on 13 March 2016. Retrieved 3 December 2015. ^ Apple touch-screen patent war comes to the UK (2011). Event occurs at 1:24 min in video. Archived from the original on 8 December 2015. Retrieved 3 December 2015. ^ Star7 Demo on YouTube. Retrieved on 2013-08-16. ^ "The LG KE850: touchable chocolate". ^ Travis Fahs (April 21, 2009). "IGN Presents the History of SEGA". IGN. p. 7. Archived from the original on February 14, 2012. Retrieved 2011-04-27. ^ Lancet, Yaara. (2012-07-19) What Are The Differences Between Capacitive & Resistive Touchscreens? Archived 2013-03-09 at the Wayback Machine. Makeuseof.com. Retrieved on 2013-08-16. ^ Vlad Savov. "Nintendo 3DS has resistive touchscreen for backwards compatibility, what's the Wii U's excuse?". Engadget. AOL. Archived from the original on 12 November 2015. Retrieved 29 July 2015. ^ Seetoo, Dustin. "How Does Touch Screen Technology Work?". Premio. Premio. Archived from the original on 2017-08-18. Retrieved 18 August 2017. ^ Hong, CH; Shin, JH; Ju, BK; Kim, KH; Park, NM; Kim, BS; Cheong, WS. "Index-matched indium tin oxide electrodes for capacitive touch screen panel applications". J Nanosci Nanotechnol. 13: 7756–9. doi:10.1166/jnn.2013.7814. PMID 24245328. ^ "Please Touch! Explore The Evolving World Of Touchscreen Technology". electronicdesign.com. Archived from the original on 2015-12-13. Retrieved 2009-09-02. ^ "Early projected Capacitance Touchscreen development". ^ "Use of RC oscillator in touchscreen". ^ Beyers, Tim (2008-02-13). "Innovation Series: Touchscreen Technology". The Motley Fool. Archived from the original on 2009-03-24. Retrieved 2009-03-16. ^ "Acoustic Pulse Recognition Touchscreens" (PDF). Elo Touch Systems. 2006: 3. Archived (PDF) from the original on 2011-09-05. Retrieved 2011-09-27. ^ "Espacenet - Original document". Worldwide.espacenet.com. 2017-04-26. Retrieved 2018-02-22. ^ "Touch Screens in Mobile Devices to Deliver $5 Billion Next Year | Press Release". ABI Research. 2008-09-10. Archived from the original on 2011-07-07. Retrieved 2009-06-22. ^ "Insights Into PVDF Innovations". Fluorotherm. 17 August 2015. Archived from the original on 15 October 2016. ^ "New Screen Technology, TapSense, Can Distinguish Between Different Parts Of Your Hand". Archived from the original on October 20, 2011. Retrieved October 19, 2011. ^ "TapSense: Enhancing Finger Interaction on Touch Surfaces". Archived from the original on 11 January 2012. Retrieved 28 January 2012. ^ "ANSI/HFES 100-2007 Human Factors Engineering of Computer Workstations". Human Factors & Ergonomics Society. Santa Monica, CA. 2007. ^ "Ergonomic Requirements for Office Work with Visual Display Terminals (VDTs)–Part 9: Requirements for Non-keyboard Input Devices". International Organization for Standardization. Geneva, Switzerland. 2000. ^ "iOS Human Interface Guidelines". Apple. Archived from the original on 2014-08-26. Retrieved 2014-08-24. ^ "Metrics and Grids". Google. Archived from the original on 2014-07-16. Retrieved 2014-08-24. ^ "Touch interactions for Windows". Microsoft. Archived from the original on 2014-08-26. Retrieved 2014-08-24. ^ Hoober, Steven (2013-02-18). "Common Misconceptions About Touch". UXmatters. Archived from the original on 2014-08-26. Retrieved 2014-08-24. ^ Hoober, Steven (2013-11-11). "Design for Fingers and Thumbs Instead of Touch". UXmatters. Archived from the original on 2014-08-26. Retrieved 2014-08-24. ^ Hoober, Steven; Shank, Patti; Boll, Susanne (2014). "Making mLearning Usable: How We Use Mobile Devices". Santa Rosa, CA. ^ Henze, Niels; Rukzio, Enrico; Boll, Susanne (2011). "100,000,000 Taps: Analysis and Improvement of Touch Performance in the Large". Proceedings of the 13th International Conference on Human Computer Interaction with Mobile Devices and Services. New York. ^ Parhi, Pekka (2006). "Target Size Study for One-Handed Thumb Use on Small Touchscreen Devices". Proceedings of MobileHCI 2006. New York. ^ Lee, Seungyons; Zhai, Shumin (2009). "The Performance of Touch Screen Soft Buttons". Proceedings of the SIGCHI Conference on Human Factors in Computing Systems. New York. ^ Bérard, François (2012). "Measuring the Linear and Rotational User Precision in Touch Pointing". Proceedings of the 2012 ACM International Conference on Interactive Tabletops and Surfaces. New York. ^ Hoober, Steven (2014-09-02). "Insights on Switching, Centering, and Gestures for Touchscreens". UXmatters. Archived from the original on 2014-09-06. Retrieved 2014-08-24. ^ Hoober, Steven (2013-02-18). "How Do Users Really Hold Mobile Devices?". UXmatters. Archived from the original on 2014-08-26. Retrieved 2014-08-24. ^ "gorilla arm". Catb.org. Archived from the original on 2012-01-21. Retrieved 2012-01-04. ^ "Gesture Fatigue ruined light pens forever. Make sure it doesn't ruin your gesture design". Gesture Design Blog. Archived from the original on 2015-02-13. Retrieved 2014-08-23. ^ David Pogue (January 3, 2013). "Why Touch Screens Will Not Take Over". Scientific American. Archived from the original on January 6, 2013. Retrieved 2013-01-06. Sears, A.; Plaisant, C. & Shneiderman, B. (1992). "A new era for high precision touchscreens". In Hartson, R. & Hix, D. (eds.). Advances in Human-Computer Interaction. 3. Ablex, NJ. pp. 1–33.